No Christmas knitting to report here. I'm not a scrooge, we are actually doing lots of Christmas-y things at my house, but knitting isn't one of them. As a general rule, I do not knit for Christmas gifts...at least, not since I had children. I do have an almost-knitting-related post, though. Jakers! 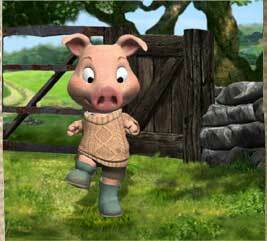 draws viewers, ages four-seven, into the imaginative world of Piggley Winks. Grandpa Piggley Winks, the elder family member in a typical contemporary, chaotic household of American city-dwellers, entertains and educates his grandchildren with tales of his childhood on Raloo Farm in the village of Tara in Ireland. As Grandpa's stories unfold, we travel back in time to the comical adventures of the young Piggley Winks (a mischievous pig, pictured above) and his best friends, Ferny (a young bull) and Dannan (a girl duck). Piggley and his playmates love to create adventures for themselves in the Irish countryside, all based on their own imaginations. So what does this have to do with knitting? Well, first, please note that the pig pictured above is wearing a rather nice Aran sweater. Also, Piggley Winks lives on a farm where there is a very cool flock of sheep, including Wiley, who I believe has the voice of Mel Brooks. Today Wiley and his buddies did some very cool dancing around the farmyard, complete with drums and fanny-wiggling; and later on in the show, one of the sheep gave birth to a lamb. I have yet to see a character actually knitting, but it's only on once a week here, so I haven't seen that many episodes. I'll keep you posted.